Milcor U-LP-72120 Roof Smoke Vent / Fire Vent, 72 x 120 inch (6x10'), Dual Galvanized Steel Cover Doors with a Galvanized Steel Curb Base, UL & FM Approved. aka BIG SMOKEY. Made in USA by Milcor. Price/Each. Cover: Covers are 22 Gauge Galvanized Steel composite bonded to high-strength 2" rigid foam insulation core. 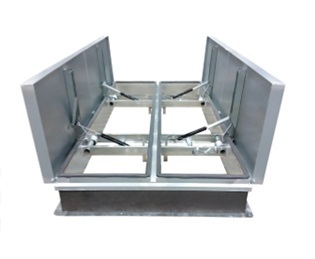 Curb: Curb: 16 gauge galvanized steel, 13.5" high curb with a and 3.5" wide flange for securing to roof deck. Frame and curb are fully welded and ground smooth. Insulated with 1" of fiberboard insulation. Gasket: Polyurethane Foam Gasket adhered to the entire perimeter of curb. Latches:Latch designed to open automatically with parting of single 360 degree fusible link, or manually with interior and exterior pull release handles without disturbing the fusible link. Covers are designed to hold covers closed when subjected to 240 psf uplift pressure for U-LP or 225 psf uplift pressure for U-LPA or U-LPAG. Sizes: 48x48,48x60, 48x84, 48x90, 48x96, 54,48, 54x60, 54x72, 60x60,60x72, 60x84, 60x96, 60x108, 60x120, 60x132, 60x144, 66x72, 66x84, 66x96, 66x108, 66x120, 66x132, 66x104, 72x72, 72x108, 72x120, custom.